The whistle of the Metra, the roar of the yellow-bellied builder’s crane. Then there’s real nature in action. In recent weeks the ducklings of Duck Island, that webbed pied-à-terre in the center of Botany Pond, had to make way not only for backpacked pedestrians but also for bulldozers, cranes, pipelayers, compressors, and more—all assembled to install chilled-water lines in the Main Quad. The digging of the trenches began the Monday morning after June Convocation—right beside Botany Pond. 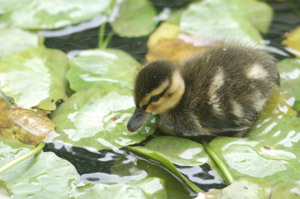 One little duck...just a few days old. Unruffled, the ducklings took the commotion in stride. As did the red-eared turtles, frogs, and heron who are also in residence and make the pond popular with students, toddlers, and at least one very interested Chesapeake Bay retriever. Botany Pond’s fauna—ducks paddling, turtles sunning, frogs harrumphing, goldfish flashing, and gray squirrels stretching for a cool drink—has been matched by its flora—waving reeds, daylilies, and waterlilies colorful enough for Monet. Meanwhile those parts of the quads that remain unturned are mowed less frequently, and so the Main Quad resembles a grassy, tree-shaded meadow. If not for the bulldozers, cranes, pipelayers, and compressors—and their distinctive calls—it would be easy to feel at one with nature. That’s mild-mannered nature of course, not Tennyson’s “Nature, red in tooth and claw.” But the campus saw a demonstration of Nature with a capital N on July 5. The dawn’s meteorological pyrotechnics came complete with a series of microbursts that touched down along portions of the South Side, including Hyde Park and Jackson and Washington Parks. The casualties included 64 trees, many along the Midway. After University work crews spent two weeks clearing away the felled timber, the task of evaluating and pruning trees injured but still standing began. As trees were cleared, shattered windows replaced, and power restored, locals recalled that microbursts were discovered by the late U of C tornado expert Tetsuya Fujita. In 1975 Fujita, nicknamed “Mr. Tornado,” implicated microbursts—the term he coined to describe sudden downdrafts that create extremely strong winds on or near the ground—in numerous aircraft accidents. On May 8 Associate Editor Sharla Stewart gave birth to Michael David Stewart. Sharla will continue to write for us, but she will spend most of her time introducing Michael to the world around him (on July 3 he took in the city’s fireworks spectacular from a picnic spot on the lakeshore lawns of the Field Museum). We will miss Sharla’s intellect, talent, and industry, but we’ll try to lure her back into the office—and these pages—as often as possible.